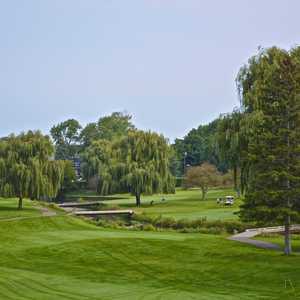 YPSILANTI, Mich. - One of the biggest shames in golf is when you have a beautiful property and course design, but the conditions just aren't up to snuff. It should be a classic course golfers from all over the area eagerly visit regularly, but instead, it's a course seldom played by those who are simply willing to forgive its imperfections. With the golf market in Michigan being ultra-saturated, each course must make the most of its property. Gone are the days where you can cut corners. Maintenance must be on point and prices have to be competitive. Five years ago Eagle Crest Golf Club, located just west of Metro Airport on I-94, saw the writing on the wall. The property was beautiful and course design was solid, but conditions were unremarkable. Greens were rugged, fairways were often flooded and Canada Geese commonly found their way off Ford Lake to the course and left plenty of evidence to prove it. 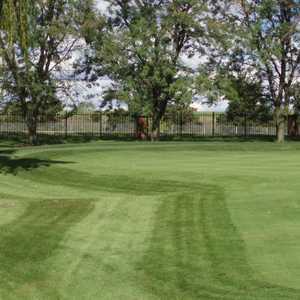 Green fees were a reflection of the property's potential, not the status quo. Then, things changed in a big way. Davey Golf was brought in by management to overhaul the course's maintenance, in hopes of finally realizing the property's potential. Eagle Crest Superintendent Kyle Celmer said what he saw when he came aboard wasn't pretty. "Fairways were just rounded off and there was no approach to them," Celmer said. "There were no collars, tees were bare and dusty, lake levels were high and there was poor plant health." Celmer previously had a stint at two private country clubs, one at the Country Club of Fox Meadow in Ohio and at the Highlands in North Carolina. He envisioned bringing to Eagle Crest the kind of conditions expected at a private club. To deal with the geese problem, a resident "goose dog" was brought in by Celmer to scare them off. These days, geese still find their way to the course (it's inevitable given the course nestles right up to Ford Lake), but it's more of an occasion than nuisance. In the four years since he's overseen Eagle Crest's revitalization, Celmer said he's now proud of the product, but still plans on making tees a little flatter and bigger and wants to add new tee boxes on certain holes as well. In 1989, Eastern Michigan University opened Eagle Crest (formally known as Huron Golf Club, named after the indigenous Native American tribe to the area. The name changed shortly after EMU changed their mascot from the "Hurons" to the "Eagles") was designed by Karl Litten. It's the home course to the Eagles and also became a host of the Michigan high school boys and girls state finals in 2002. The hilly, scenic terrain also served as a perfect site for the NCAA Great Lakes Cross Country Invitational last fall, which brought more than 5,000 spectators and participants to the course. The course plays 6,411 yards from the blue tees, but a special set of Green tees are set out for college and high school tournaments. There are three sets of permanent tees, with the forwards playing 4,944 yards. The Marriott Hotel opened with the golf course in 1989, but isn't affiliated with the university. Stay-and-play packages are available, as well as a variety of corporate specials for golf outings and conferences. Eagle Crest is nothing like you'll find in southeastern Michigan. It sits right off Ford Lake and has the kind of feeling a Florida course might have if the land was a little more undulating. The result is a slew of exciting holes and several points of breathtaking scenery. Along with the scenery found as you stroll up to the signature 16th green, the 10th fairway provides a stunning view as you look over the entire golf course and Ford Lake. Before lining up your second shot, look behind you for a moment and bask in the beauty for a moment. Within 18 holes come several distinct feels of golf holes at Eagle Crest. Holes 1-6 play on the course's lowlands down near Ford Lake and water comes into play on nearly every shot. Holes 7-11 play toward the front of the property on the high ground, where water is an afterthought. The seventh through ninth holes, in particular, are extremely flat and golfers can put their "water balls" away for a few holes and swing away. You can even drive for the green on the 316-yard eighth, which is guarded only by bunkers and out of bounds to the right. The backside starts of with the par-5 10th, which is flat aside from the ravine you must carry on your tee shot. The 11th is the first of a series of extremely tricky approaches on the back nine, where an elevated green is guarded by a tall tree to the right of the green. The course then finds its way back into the low-lying areas, the exception being the tee shot from the par-3 14th, which features an elevated tee about 60 feet above the hole. Of course, everything at Eagle Crest leads up to the 16th, easily one of the most memorable in the area. "It's the ultimate risk-reward hole," Head Professional David Horstman said. "Usually on a par 5, the risk is on the second shot. On the 16th, it's the drive, second and third shot. There's no room for error." Horstman recommends taking an iron off the tee, which is a tight shot over water and through a corridor of trees. Then lay up with a mid-iron setting up a wedge shot into the extremely shallow peninsula green, guarded by water and rocks. However, the hole plays just 475 yards, so a driver that finds the fairway will undoubtedly have you swinging for glory with a long iron on your approach. The par-3 17th resembles something out of coastal southern golf and features a pond guarding the front right as well as large bunker that wraps around. The 18th is the only uphill hole on the course, which is remarkable given the property and plays into an elevated green that has a spectator hill wrapped around it. Eagle Crest finally has the conditioning to go with its top-notch resort facilities. And with its new, competitive pricing, it makes for arguably the best public round of golf in Washtenaw County. It's extremely convenient as well - 15 minutes west of Detroit Metro Airport on I-94. The signature 16th is also one of the best holes in the area. Also, just because it's just off the freeway, while on property there is no evidence of cars and trucks scooting past less than a half-mile away. The Grille at Eagle Crest if full service and provides burgers, sandwiches, etc., and also serves alcohol. You can eat inside or lounge outside and enjoy the view. The Marriott hotel features Bentley's, which serves breakfast, lunch and dinner. Bentley's has a variety of sandwiches and roll-ups for lunch and a great steak menu for dinner. Player's Sports Lounge features more "bar food" as well as pool and other bar activities. If you want to head to downtown Ypsilanti, try Haab's if you're in the mood for some killer steaks. For wings buffs, there's a Buffalo Wild Wings downtown as well. For nightlife, be sure to hit up Depot Town, which has a variety of club and bar options, including dueling pianos at Pub 13. For pool, Sticks is the place to be. The obvious choice is the Marriott, just steps from the clubhouse. Summer stay-and-play packages start at $195 for double-occupancy, two rounds of golf with a cart and two free breakfasts at Bentley's. Prices drop in the off-season. Weekdays: $50 Riding/$36 Walking before 2 p.m. $40/$26 after 2 p.m. Twilight: $30/23. Weekends: $60 cart mandatory before 2 p.m. $50/36 after 2 p.m. Twilight $35/28. Discounts are available for Marriott Guests, EMU affiliates, EMU students, seniors and juniors.